Particle count test for clean room classification as per ISO 14644-1. Filter Intergity test for HEPA filters using DOP / PAO challenge aerosol as per ISO 14644-3. Air Velocity, Volume flow rate and Air uniformity test for supply air terminals as per ISO 14644-3. With our in-depth knowledge in this domain, we are actively engaged in manufacturing a supreme quality range of Particle Count Test Machine. We are counted amongst the foremost service providers, engaged in offering Particle Count Measurement Service at very affordable price to the clients. 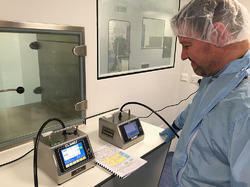 This is one of the most important Test as per Cleanroom validation concern using TSI Particle Counter (100LPM or 50 LPM) .This test is required to qualify the status of Cleanliness class of Cleanroom, Laminar Airflow Unit, Bio-safety cabinet, Isolators, FBD, FBE, Autoclave, Dry heat sterilizers, Air Showers, Coaters, Garment Cubicles, Vial Sterilization Tunnels, etc. This system consist of complete extraction and filtration assemblies. Component is washed with specific liquid and this liquid is then collected in suitable container. Professionals work hard and provide this Dynamic Airborne Particle Count Test in much satisfactory way. This calibration service is done by experts using best calibration unit and following latest method. We apply genuine price for this calibration work and present accurate report. Our company has achieved widespread recognition in providing Particle Count Testing Service. Our company is highly rated in providing Clean Room Particle Counting Service. Ultra Air Solutions Pvt. Ltd.